Mens Crocodile Wallet Unique Croc Skin Wallet. Get a look at this gem, a mens crocodile wallet made from a genuine croc skin finished in charcoal black. Our unique and exotic mens crocodile wallet comes with a matching black interior with croc panel features to hold your cards and cash. This is a wallet for an adventure loving kind of guy, a guy who likes to spend time in the great outdoors or likes to do a spot of hunting. We’ve done a limited run of these and they wont last long, so grab one then pull this seriously cool leather wallet out when its your turn for next round and your mates will forget its you turn to pay… well, maybe. 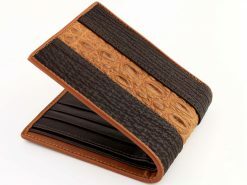 This is a beautiful wallet, but wear it with the rough side inwards so your pants will not tear from the sharp edges. Five stars! I got the new wallet today. Very nice, I'm almost too afraid to use so as not to mess up the leather. :) ll save it for special times.